Until very recently, the four border communities (Calais, St. Stephen, and the Milltowns) have been largely one social and economic unit. Cross border romances and marriages have always been common. The great lumber barons harvested the forests with equal voraciousness on both sides of the river, floated the logs to mills on whichever side was more convenient and shipped the finished product in whatever ship was available. Duties, import restrictions, export licenses and the nationality of workers were largely ignored and, if a revenuer or customs agent did have the audacity to question certain practices, he was soon convinced of the wisdom and financial advantage of looking the other way. 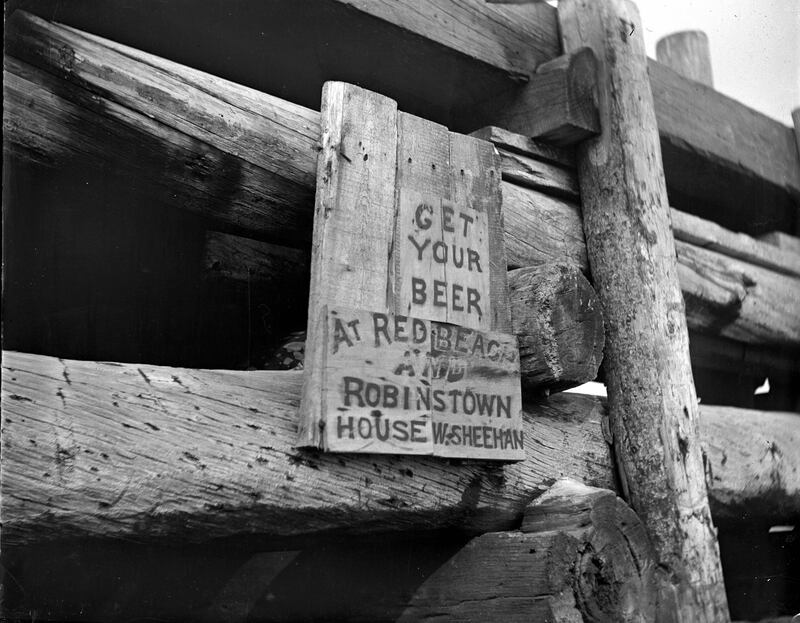 Even during prohibition when alcohol was illegal in Maine, there was no serious attempt to stop smuggling. Louis Morrison tells of his trips to St Stephen as a youngster in the 1920’s on his uncle’s wagon to get loam. The team waited at the pit until the bootlegger arrived to load a dozen 3 gallon tins of Belgian 180 proof rum in the bottom of the wagon. The tins were covered with loam and the wagon brought back across the bridge with a wink and a nod from the customs officer. In reality, the only division between Calais and St Stephen was political. St Stephen was not only a different town; it was in a different country. 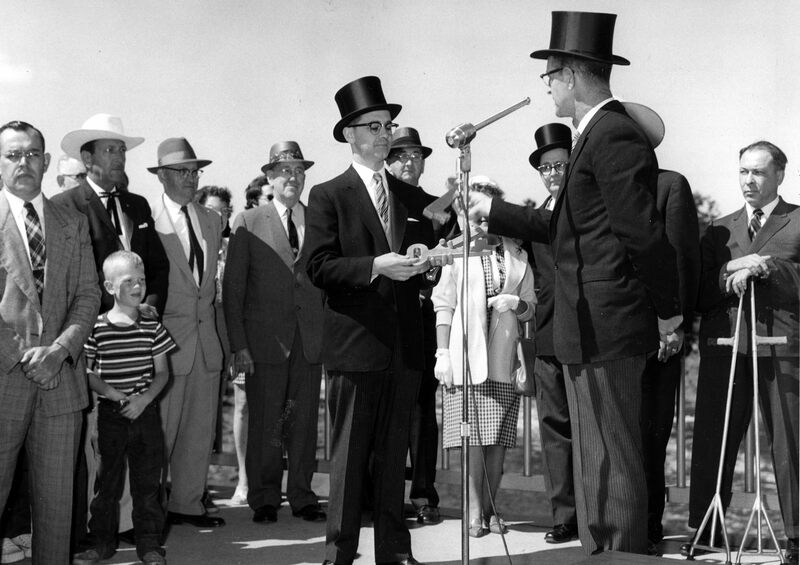 However even this changed during International Frontier Week in 1961 when the first and probably only international election was held on the U.S.-Canadian border and Bob Treworgy of Calais was elected to serve mayor of the entire international community from June 30, 1961 to July 8, 1961. 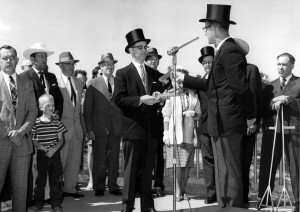 Bob Treworgy receives the key to both Calais and St. Stephen for his role as Mayor of both towns in 1961. 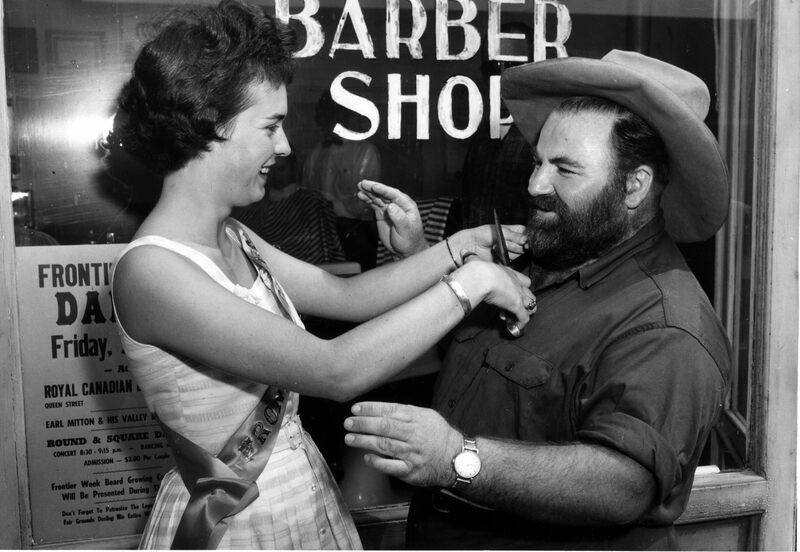 Frontier Week in 1961 was the predecessor of today’s International Festival and it was a very big deal. The program for Frontier Week is 100 pages long, listing 9 days of events. It included messages of congratulations from President John F. Kennedy, Prime Minister John Diefenbaker and other political notables. Original poetry in the program was interspersed with local histories and ads from nearly every business in the area. Beauty Queen Pat Stewart tries her hand at trimming Bev Greenlaw’s beard. Events ranged from the Frontier Week Beard Contest to a challenge baseball game between Gov. John Reed and his executive council and Premier Louis Robichaud and his cabinet. The umpires were the Governor of Massachusetts and the Premier of Nova Scotia. 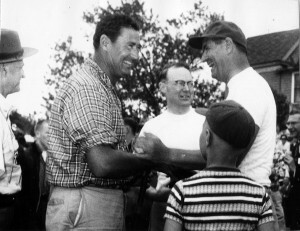 A fishing derby featuring Red Sox great Ted Williams attracted many of the famous fishermen of the day to the area and each day was filled with concerts, dinners, grand balls, square dancing, contests of every sort including a bathing suit contest sponsored, not surprisingly, by the Lions Club, an international soap box derby and a huge parade on July 4th. Patricia Stewart of Calais won the beauty contest and Ted Williams hit a single for each side in the baseball game. The legendary Ted Williams played with local teams during the 1961 Frontier Week. Sadly, many of the businesses in the program are only memories-The St Croix Valley Drive-In, Unobskeys, Lincoln Motor Court, Donovan’s Nationwide, Pollock’s Mobil, Down East TV., Western Auto, Andrews Tobacco Stand, Grant’s Dairy, Algar’s Cleaners, Osbourne’s Pharmacy, Cole Bridges, Barnes Bros., H. S. Silverman, Jim Kelly’s Clothing, Tupper’s Cabins, The St Croix Music Shop, F.L. Stewart, Vira’s Restaurant, Molly’s Restaurant, Bates Jewelers, Trimble’s Shoe Store, Cassidy’s Shoe Store, Cold Spring Motor Court, Ross Bros., and Webster’s General Store in Robbinston are all gone. 20,000 people were expected to participate and apparently most of them came. Presiding over this magnificent event was Bob Treworgy, Calais businessman and, for a week, Mayor of the entire St Croix Valley.